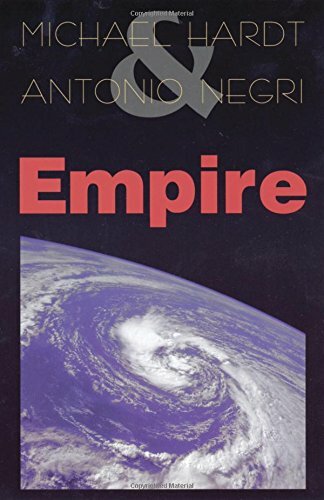 Michael Hardt, Antonio Negri, Empire. Imperialism as we knew it may be no more, but Empire is alive and well. It is, as Michael Hardt and Antonio Negri demonstrate in this bold work, the new political order of globalization. It is easy to recognize the contemporary economic, cultural, and legal transformations taking place across the globe but difficult to understand them. Hardt and Negri contend that they should be seen in line with our historical understanding of Empire as a universal order that accepts no boundaries or limits. Their book shows how this emerging Empire is fundamentally different from the imperialism of European dominance and capitalist expansion in previous eras. Rather, today’s Empire draws on elements of U.S. constitutionalism, with its tradition of hybrid identities and expanding frontiers. Empire identifies a radical shift in concepts that form the philosophical basis of modern politics, concepts such as sovereignty, nation, and people. Hardt and Negri link this philosophical transformation to cultural and economic changes in postmodern society–to new forms of racism, new conceptions of identity and difference, new networks of communication and control, and new paths of migration. They also show how the power of transnational corporations and the increasing predominance of postindustrial forms of labor and production help to define the new imperial global order. More than analysis, Empire is also an unabashedly utopian work of political philosophy, a new Communist Manifesto. Looking beyond the regimes of exploitation and control that characterize today’s world order, it seeks an alternative political paradigm–the basis for a truly democratic global society.